Are you looking for a challenging adventure, including off-road tracks, and you don’t want to travel all that far? Well, then Bosnia Herzegovina is the place to be! A yearly average temperature between 20 and 26 degrees Celsius make this splendid and rough country with its almost untouched nature, more than worthwhile for mountain biking, swimming and running. The ‘menu’ for this physical adventure consists out of an attractive mixture that would make many sportsmen or adventurers instantly jealous. We have set up special, challenging mountain bike and running routes and our mountain bike partners in Jezero and Sarajevo are fanatic and committed bikers who strive towards latting you enjoy maximum pleasure with these magnificent tracks. In addition, you will swim in a gorgeously clear lake, surrounded by beautiful mountains: a location you will never forget! Besides mountain biking, trail running and swimming there are other options to enjoy Bosnia: walks and hikes along breathtaking sites but also most attractive cultural sites like Mostar, the hidden Tito Bunker and the wood carving industry in Konjic. De workouts are given by Diederik Scheltinga en Evert Scheltinga. Rob Barel en Johan Neevel have explored the site and have contributed to the content of the workouts. All trips start from the Herzegovina Lodges and our accomodation at Boracko Lake. Here 2 or 4 people appartments are available, with stunning scenery on Rock formations, forested hills and the emerald green Boracko Lake. The event will be organised with a minimum number of 60 participants. Following reservation or booking for the trip FIT Adventure Sports Travels invites you to attend a pre-travel participants meeting. Here you will receive detailed information on background, program and various aspects about this trip. Also you will have ample opportunity to ask questions and gather additional documentation. N.B. Optional programs our available to extend your stay either before or after the trip offered here. Please contact our tourist agency. We offer a daily opportunity to participate in a swim of run-training before breakfast and/of at the end of the afternoon. Also there is a daily central briefing. De workouts are given by Diederik Scheltinga en Evert Scheltinga. Depending on the time of arrival, you will have the opportunity to get familiar with the immediate surroundings. Today’s mountain bike tour offers a mixture of sports, nature and culture. Leaving Herzegovina Lodges various groups of participants (combined according to their mountain bike experience levels) start the tour towards Mostar. You will mountain bike over unpaved gravel roads, sometimes aligned with big boulders and impressive rocks, but yet at the same time offering magnificent views on Mostar. Of course, this city shows us its ‘bridge’, but also offers us the opportunity to become familiar with its many narrow streets. 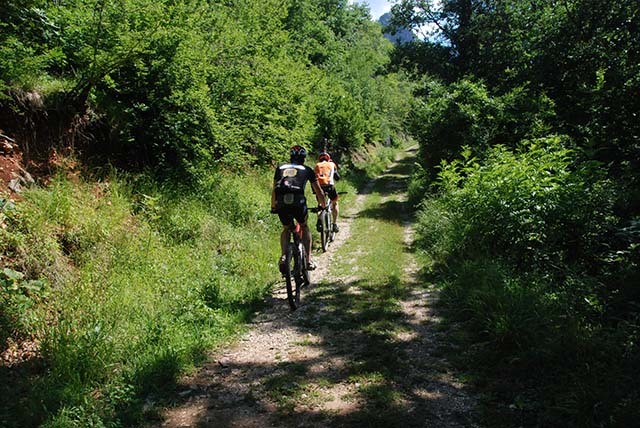 Mountain bike tour to Cicevo Rula, taking us over mainly unpaved roads through green forests and along high mountain ridges. 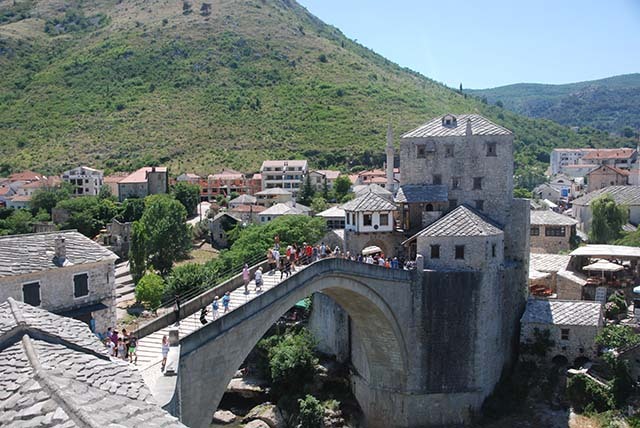 On the way we will make stops at several interesting locations like hanging bridges along Neretva River and grave tombs of Cathars. We will enjoy dinner in typical local eating houses in the mountains. Today our mountain bike tour takes us to a magnificent mountain top at an altitude 2000 m. During the last 100 m the slopes of the mountain will bring back your speed to about 5 to 6 km per hour. This mountain will turn out to be a challenging and patient ‘opponent’, whilst offering you off-road bike sensations in gorgeous natural surroundings! A magnificent mountain bike tour today around Lake Boracko. In addition also a technical single track is offered for those who are interested. Mainly unpaved roads and only 25% we mountain bike over paved roads. The afternoon program offers a variety of options for free leisure time. Today’s mountain bike tour will bring you to an enchanting village, where time seems to have come to a standstill during the last centuries. Located at an altitude of 1500 m, the roads leading to this village offer stunning views, that we may enjoy during our mountain biking. Our first challenge is climbing up the mountain nearby Konjic and this mainly over paved roads. In Konjic you are directly ‘invited’ to go on to Lukomir along beautiful natural surroundings. Another option is a bus transfer to a beautiful country site location among mountaintops, from where you can mountain bike off-road and cover a distance of 70 km. This tour takes you along the former olympic’s ski run to Lukomir, before descending to Konjic and climb up the mountain again to Lake Boracko. Back in Herzegovina Lodges dinner will come along with entertaining live music, like the Bosnian sevdah music, more or less comparable to the Portugese fado. Besides this type of music, also modern and popular songs will be performed. A bus transfer will take us to Sarajevo International Airport, from where we fly back to Cologne – Bonn. Price includes: train ticket, entrance ticket Sarajevski Ratni Tunnel, tourist guide and local transfer in Sarajevo, bus transfer from Sarajevo to Konjic and, finally, on the mountain bike back to Lake Boracko. Following breakfast we leave for Sarajevo, the city so famous for its religious diversity. Representatives of Islam, Jews, Catholics and members of the Orthodox Church live already for centuries next to each other! On the other hand Sarajevo has again turned into a dazzling city with cafes, music, art and many cultural events and festivities. Since the war ended in 1995 the city has rebuild itself and, again, its people enjoy the city and all it has to offer. A visit to Sarajevski Ratni Tunnel. This tunnel has been build during the war when Sarajevo got besieged. It runs below the city’s airport and played an important role in the survival of the town. Certainly, when the water levels allow, Bosnia and Herzegovina are Europe’s best locations for rafting, maybe even in the entire world! That’s why the Vrbas River in 2009 was the ideal site fort he World Championships Rafting. FIT Adventure Sports Travels offers rafting programs for ‘starters’ as well as the more experienced sportsmen in this field. A bus transfer will take us to the starting point fort he rafting event: either the Tara River, or the Neretva River. The first river garantees challenging rafting through almost untouched wilderness and unforgettable scenery, not to be enjoyed anywhere else in Europe. The second river, Neretva, offers an exciting rafting experience in wild and still intact nature and will take you through deep canyons and steep mountain slopes with unique endemic flora and fauna. Prices: when sufficient interest is shown, tailor-made arrangements will become available. Price includes: entrance ticket, mountain biking to Konjic and return to Boracko Lake as well as mountain biking from the center of Konjic to the Titoo Bunker and back. This mountain bike tour entails a visit to the city of Konjic and includes – via an optional bus transfer – a visit tot he Titoo Bunker. An English speaking tourist guide will provide us with historical background information on this secretly built project, that in 1953 became the underground headquarters for the President Tito. It resulted in one of the biggest infrastructural project of the former Yugoslavian army. A 2 hour city-walk through Konjic will take us past ancient cemeteries, a mosk, an orthodox and a catholic church. The walk also allows to visit the local market to buy tabacco, smoked meat, special types of cheeses and other local food products. In the meantime we visit one of the many bakery shops (slasticarna) to enjoy a rich assortment of sweets. Konjic being Europe’s center of wood carving industry. Depending on the actual water levels, we start this morning with a bus transfer to the Tara River. It is located in the southern region of Bosnia and Herzegovina and forms the natural border there with Montenegro. The 1300 m deep ‘Grand Canyon’ of the Tara River is a protected natural reserve and has a long tradition wit hall kinds of water sports, mainly rafting and kayakking. Local people like to come here for family gatherings, picknicks, barbecues and outdoor activities. 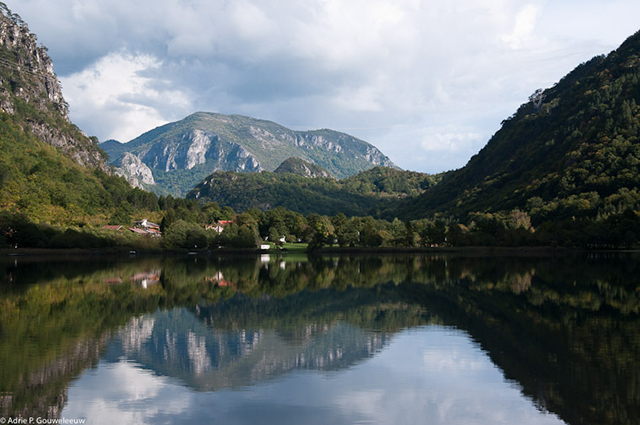 We can enjoy a splendid 10 km hiking tour around Boracko Lake and combine this with a visit to Konjic. It allows us to discover the ‘real’ Bosnia: its continental climate, extended forests and vast meadows, being the shepherd’s paradise. Walking through the untouched natural surroundings of Bosnia is a fantastic way to get familiar with this country! There might be an opportunity to have coffee with local people here, who still live their authentic life high up in the mountains. Instead of an organised lunch we bring along our own lunches, prepared early in the morning . Later in the afternoon we return to Konjic, followed by a slendid dinner party along Boracko Lake. International transfer mountain bikes: € 200,00. Either open for personal private booking, or through our tourist agency. An additional insurance for transfer and use in Bosnia is very much recommended.